A woman has had her faith reaffirmed by seeing an image of Jesus Christ scorched onto her iron. Mary Jo Coady from Methuen, Massachusetts, told the Boston Herald that she was surprised by the supposed manifestation. The 44-year-old said: "I wouldn't say it's a miracle, but it made me say 'Wow!'. I didn't panic, I was carrying the laundry, looked down at the iron and there was the image of Jesus. I picked it up and asked my daughters to take a look at it to make sure I wasn't crazy. They were as amazed as I was." She added: "I was going through personal issues and this reaffirmed my faith. Believe it or not, finding and seeing that image was very uplifting. My faith was down, but seeing this made me think, wow, Jesus is there. 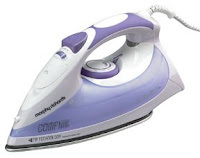 If you're in need of a new iron, take a look at our latest range on www.24ace.co.uk. You never know, Jesus may decide to visit you too!